Now, I’m not criticizing, but by the looks of Santa, it seems that he’s definitely eaten his share of Christmas cookies over the years. And I’m certainly not one to pick on Santa, of course, but I have the feeling that he’s been just a wee bit naughty himself, and hasn’t shared as many cookies with his faithful reindeer friends as he could’ve. Last I saw those precious reindeer—those hard-working, sleigh-pulling, North Pole-weather-enduring lil’ fellas—they frankly looked a touch peeked to me, a little on the thin side; and Rudolph’s nose, usually a glorious blazing red, seemed to lack that brightness that usually blinds. It made my heart sink just a bit; made me feel like perhaps Rudolph wasn’t getting as many tasty Christmas treats as he’d like, because he and the other reindeer have to wait on the roof-top while St. Nick drops down the chimney, unloads the presents to all the good little boys and girls, and then polishes off the warm, freshly baked and festive Christmas cookies that were left there by those same good little boys and girls, while no one’s looking. Surely, I understand that Christmas can be somewhat of a stressful time for Santa; the sweets can be hard to resist when they’re so generously provided. But could it be at all possible that Santa has misunderstood the concept behind the Christmas cookies all these years? That there are as many cookies on the plate as there are, because he’s meant to share them with Rudolph and the other reindeer when he joins them back on the rooftop? I wonder. It got me thinking that this year, I would bake not only what I personally know to be Santa’s Favorite cookie, but I would bake a cookie that I knew Rudolph and the others could especially call their own, so they too could get their Christmas cookie fix. And I’d be sure to make it clear whose was whose. 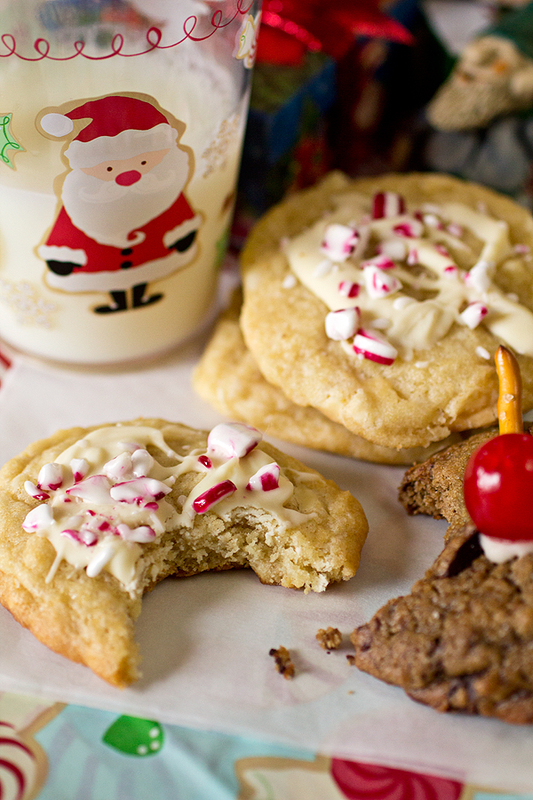 Christmas and cookies go hand in hand, don’t they? “Christmas cookies”. Just the two words conjure up an image of an extra special cookie, one that goes beyond what would constitute for an everyday-type-of-cookie. Christmas cookies are special; they’re meant to be reflective of the spirit of the holiday, reflective of the spirit of the cold weather (if you’re lucky enough to live in a region where the weather is, in fact, actually cold during the Christmas holiday), and reflective of whimsy and wonderment. 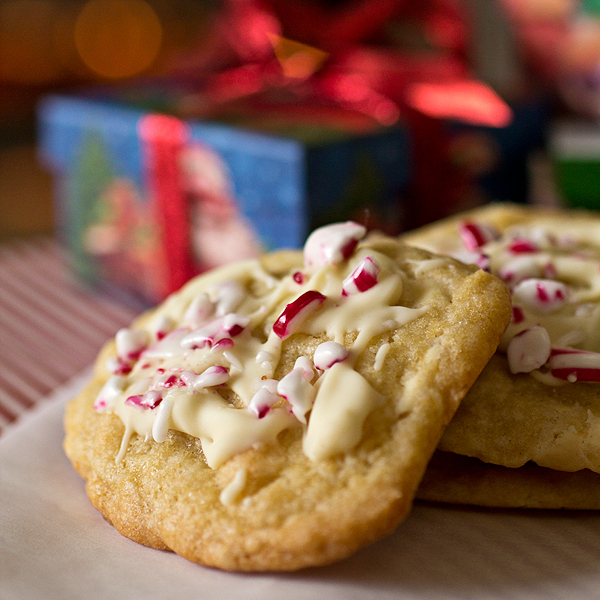 They’re meant to be decadent (who the heck wants a “lite” Christmas cookie? ), and just as fun to create as they are delicious to eat! I love ’em, and can understand why Santa does, too. So this year, I thought it’d be fun to make a Christmas cookie that would be his ultimate favorite, one with his trademark red and white colors, white chocolate chunks and a cool, vanilla-mint flavor, along with a cookie that would be Rudolph’s favorite, paying tribute to his special features, chock-full of chocolate chunks, brown sugar, cocoa and all the goodies that reindeer absolutely adore. At last, two unique cookies, one for each of them to enjoy and call their own. I have the feeling that this year Santa will get the point about sharing the cookies, don’t you think? I suppose I’m trying to be “subtly obvious”—let’s hope it works. And whether you’re are a fan of the cool, minty, sugar cookie, the one that has all the flavor of an icy Winter Wonderland, or the buttery, deeply flavored chocolatey cookie, the one that reflects the warm, toasty-ness of the winter season, make some extra for yourself to enjoy as well, by golly! 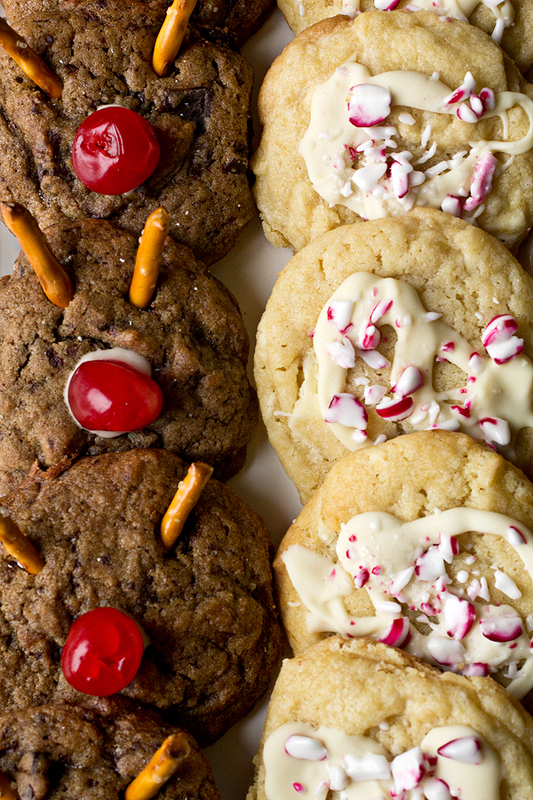 Whose cookie is YOUR favorite—Rudolph’s or Santa’s? 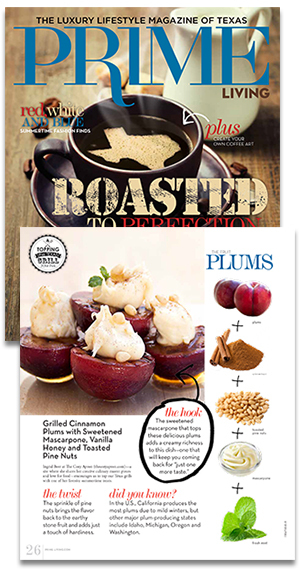 -Preheat the oven to 375, and line baking sheets with parchment paper or silicone baking mats. -Add the flour, the cocoa powder, the baking soda and salt into a medium-size bowl, and whisk the dry ingredients together; set aside for a moment. -Next, into the bowl of a mixer fitted with a paddle attachment, add the butter and the brown and granulated sugars, and cream them together until light and fluffy; next, add in the eggs and continue to mix, followed by the vanilla and then the chocolate syrup; once those are incorporated, reduce the speed of the mixer to low, and slowly begin adding in the dry (flour) ingredients a little at a time; once those are added and incorporated (be careful not to over mix the dough), add in the chocolate chunks, and mix just until those are incorporated. -Place the dough into the fridge to chill for about 20 minutes (you can leave it in the mixing bowl), and prepare the Icing “Glue” (below) in the mean time; once the dough has chilled, scoop heaping tablespoon-sized portions of the dough out and place onto the baking sheet, and bake the cookies for about 13 minutes. 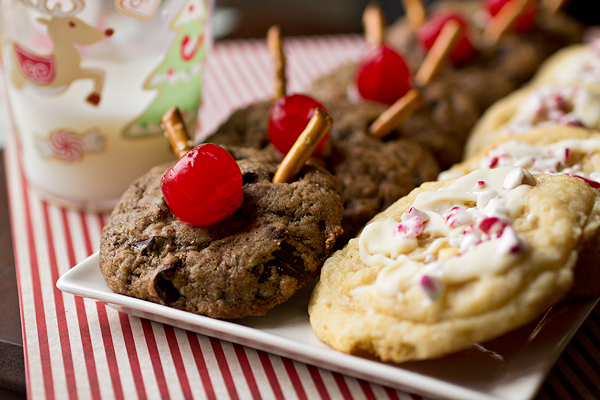 -Once cookies are baked, allow them to cool for just a moment or two, but just slightly; next, begin putting the “antlers” into the cookies by gently pushing one half of a pretzel stick into the top of each cookie (they will set as the cookie cools), and then allow the cookies to cool completely before adding the maraschino cherry “noses”. -Once cookies are completely cooled, dip each dried-off maraschino cherry just partly into the Icing “Glue”, and place the cherry “nose” onto the center of each cookie; once all noses are in place, allow the Icing “Glue” to firm up and dry before serving the cookies, as to not lose your noses! -Add the flour, the baking soda, the baking powder and the pinch of salt into a medium-size bowl, and whisk the dry ingredients together; set aside for a moment. -Next, into the bowl of a mixer fitted with a paddle attachment, add the butter and the granulated sugar, and cream them together until light and fluffy; next, add in the egg and continue to mix, followed by the vanilla and the peppermint extract; once those are incorporated, reduce the speed of the mixer to low, and slowly begin adding in the dry (flour) ingredients a little at a time; once those are added and incorporated (be careful not to over mix the dough), add in the buttermilk, and then the white chocolate chunks, and mix just until those are incorporated. -Place the dough into the fridge to chill for about 20 minutes (you can leave it in the mixing bowl); once the dough has chilled, scoop heaping tablespoon-sized portions of the dough out and place onto the baking sheet, and bake the cookies for about 12-14 minutes, until pale but baked through. -Once cookies are baked, allow them to cool completely; once cooled, place the remaining 4 ounces of white chocolate into a microwave-safe dish, and melt until completely smooth, a couple of minutes; to decorate the cookies, drizzle just a little of the melted white chocolate over the cookies (work on about 5 cookies at a time), and sprinkle over top of them some of the crushed peppermint candies; repeat the process until all of the cookies and coated decoratively. I am thinking Santa’s cookies are looking pretty good! Christmas and cookies DO go hand in hand. these look great!! Hi Rebecca, thank you very much! I love these cookies – so cute. 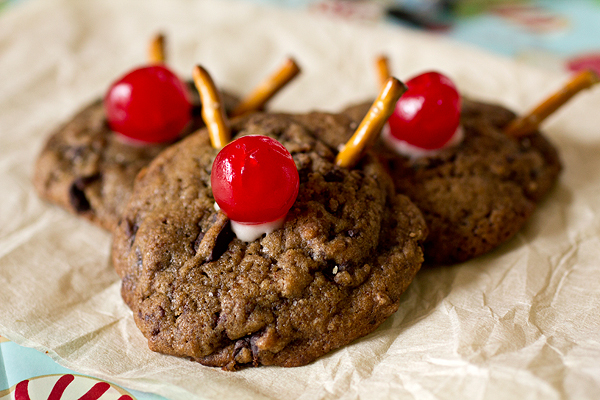 And salty pretzels in chocolate cookies sounds so yummy!! I’m ready to have cookies for dinner now! 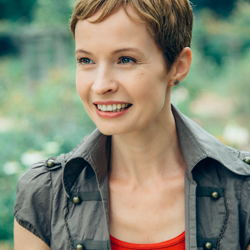 Hey it’s the holiday season – why not, Luci! 🙂 Thanks for stopping by!